2017 was a year of changes for our family. A new job for my husband, brought about an out-of-state move from Oklahoma to Louisiana. That meant meeting new people, my son is going to a new school, finding a new church, and of course, moving into a new house. Before we even walked into the house we eventually bought, my husband told the Realtor this one would be my favorite, and he was right. I don't know if it was the huge trees in the front yard, which are especially hard to come by in Oklahoma, but it turned out to be the right home for our family. 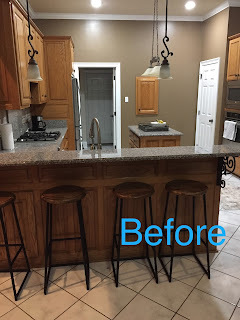 It was built in the 90s, the era of honey oak cabinets and shiny brass fixtures (which are very different from the trendy brass fixtures of today), but the previous owners had already done some renovating, leaving us with a manageable amount of updating to do. 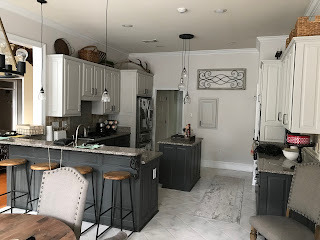 One of the first things we did was paint a lot of the darker colors a light and neutral shade of gray. I used Sherwin Williams Repose Gray in many of the rooms. We also hired a painter to fill in the wood grain on the orange-looking oak cabinets and paint them two-tones of gray. We also replaced many of the light fixtures with more industrial, black fixtures. 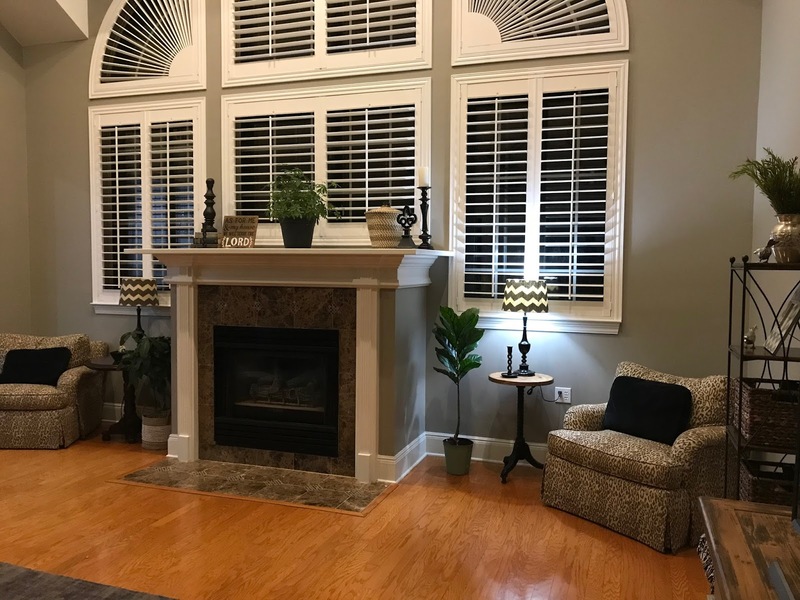 One project we put off until just a couple of weeks ago was painting over the brown in the living room with Sherwin Williams Dorian Gray. I'm really happy with how bright and updated it feels now. 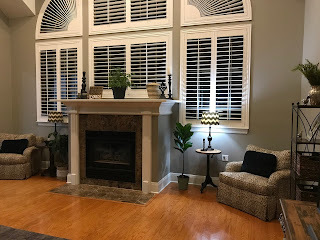 Just as I was looking for the right decor to finish off the space, someone from Commercial Palm Trees contacted me and asked if I would like to review a product. I selected the Fiddle Leaf Tree you'll see in the photo to the left, and it turned out to be a great addition to my living room. 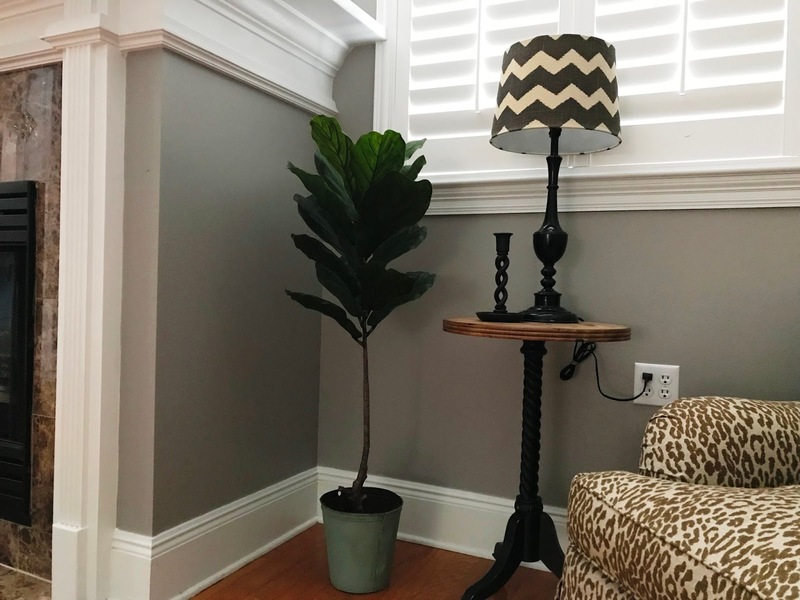 I'm not usually a fan of fake plants in a home, but this is proof that they've come a long way! You can't even tell it isn't real, and bonus, I can't kill it. The base, was a small black plastic container, so I found this rustic bucket from another part of the house, and it worked perfectly. If you're interested in reviewing one a product for the folks at Commercial Palm Trees, let me know, and I'll pass on the information to you. So, my most recent project has been using General Finishes Java Gel Stain to update the banisters to our stairs. I can't post photos yet, because lesson learned, dry times in a humid place like southern Louisiana take forever, but I'm almost finished.